The trek promised of adventure from the very beginning….only we never read the signs. 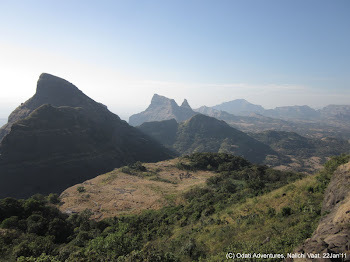 For me it was an ill-gotten holiday and by the time I was ready to leave for Chandigarh, Jayesh declared that the team of some 10-12 trekkers had now dwindled down to just 5 guys and me. Trouble started on our jeep ride from Manali to Kibber. A rocky ride led us to a gateway in the middle of nowhere, welcoming us to Spiti. Nature, as if taking cue from this, also made its presence felt. Just as we crossed the gate, our heads throbbed painfully due to the lack of oxygen in air. 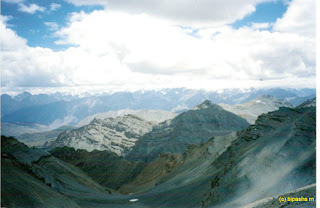 And by the time we reached Kibber, the starting point of the 9days trek to Tso Moriri in Ladakh, my condition was so severe that I had made up my mind to abandon the trek. Acclimatization day: Jayesh puked. I mean Jayesh puked! If that could happen to him, then I didn’t think I had any chance. Day 1: Bright and fresh with no headaches. Trek begins. Down and up a valley under a hot open sky. It was a long walk to the green Thaltak meadow, our camp. When M didn’t reach even after an hour we panicked. A guide was sent and M came back lips parched, white and dry. He was dehydrated. Day 2: We took it slow and steady. Just as we neared the base camp of ParangLa Pass at 17500ft, we spied ominous dark clouds on the horizon. Day 3: The dreaded 1000ft+ climb to cross the Pass. Taking even 10 steps was an effort. Our breathing was labored and headaches returned with a vengeance. Jayesh was struck and had to be carried over by a mule. It took us 4 hours to reach the pass. But when we did, it was to see the most breathtaking sight ever…..a sweeping panorama of snow-covered peaks. We camped at the base of a glacier. Day 4: We had overslept due to exhaustion. It was 9 in the morning by the time we got ready to cross the stream which was by this time in full flow. M tried to cross but was swept off by the current. The guide grabbed him at the nick of time and hauled him to the other side. This left us with only one option….climbing the slippery glacier and then crossing over to the other side. We held on to a rope, jumped crevasses and gushing rivulets and rappelled down the other side and greeted M like a long lost brother. Day 5: We got ready at 5 in the morning to cross the river again. The water was bone numbing cold and I lost sensation of legs within minutes. It was then I realized how easily M could have become hypothermic. It was hours of walking and I was on the verge of panic before sensation on my feet returned. The cloud which was hovering in the background caught up with us forcing us to camp in a hurry. Day 6: We woke up to hysterical laughter from the other tent and peeped outside to see a horrendous sight. What we hadn’t realized was that we had camped in a trough and it had rained the whole night. Now the whole area had become mud slush and our belongings were floating in it. Rain played hide and seek with us as we hurried along the trail fearing mudslides. We went to sleep while a lone wolf howled in the distance. Day 7: The clouds fleeted in and out. A mare and her filly grazed freely on a grassy knoll. An aggressive looking Changpa shepherd crossed us with his flock of hundreds of sheep carrying rice in pouches on their backs. We camped at Norbu Sumdo, the last site before crossing over to Ruphsu Valley. The wind was howling but it didn’t deter the boys from playing cricket with a rolled up plastic ball. While everybody settled in for the night, I stayed outside gazing up at the trillions of stars and the Milky Way so prominent in the sky. I felt humble and tiny in front of God’s amazing creation. Day 8: It was a glorious day. The clouds were gone leaving the mountains sprinkled with fresh snow and the sky a deep shade of blue. We had to cross the river one final time before entering the valley. This we did by huddling together to fortify ourselves against the current. A long agonizing walk over a dry, pebbled river bed took us to the exquisite Tso-Moriri…our destination. A herd of kiangs grazed nearby. The Lake mesmerized us as it changed colors along with the sun. From sparkling blue, to sea-green, grey and then back to blue-green again. The water fed by the freshly melting glacier was as clear as glass and the lake appeared divine and mystical. 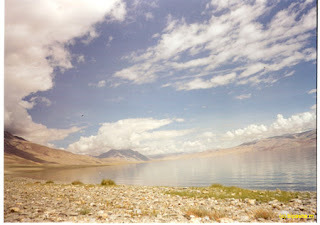 Day 9: The last day’s walk was a long 24kms along the lake’s shore. Ducks waded in the lake creating the tiniest ripples, clouds gathered and then blew away like a film in fast forward mode creating the most amazing patterns on ground, strong winds pushed us about and yet we walked silently – awe struck by the unimaginable beauty. My left leg was cramped from hip to feet but Korzok, our final destination never seemed nearer. At one point, tired, cramped and dirty I gave in to my feminine urges and cried shamelessly. We were almost at break point when we reached Korzok in the evening to loud cheers. 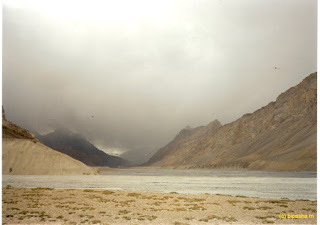 Back in Leh, as I scrubbed off 10 days of dirt and grime I was overwhelmed by a desire to go back again. 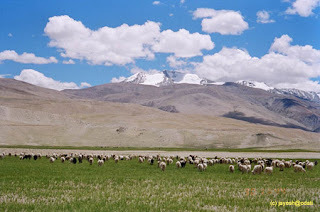 To the barren mountains and snow covered peaks, the beautiful pristine lake, the freedom of the Changpa nomad and the mare grazing on knoll, the cry of a lone wolf and a star studded sky. The hardships and adventure at every turn had enhanced our experience further showing us the reality that is nature….in its full glory. I had lost a drastic 9 kilos on this trek but in return I gained an experience which can never be repeated anywhere in the world.